I posted a few days ago about our need to cut down on paper towel use. I think I’ve been making some progress. When you get used to using convenience products, you just don’t realize how much you use them until you try to cut back or stop. 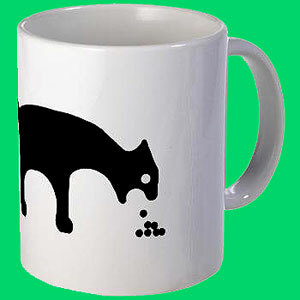 I’m on the fence about drinking my coffee out of this mug. I’ve started using flour sack dish towels to dry fruits, veggies, and lettuce after washing. I’ve started using a small lid to set my spoon down on when I make coffee (I was using a paper towel, of course). The one thing I gave in on was the cat barf. Paper towels for that. 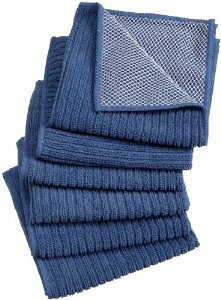 I bought two packs of these to replace the disposable scrubber sponges I use to wash dishes. I was wrong about something, however… I said that it would be hard to get away from disposables. Once I started paying attention to how much paper towels were being used, I started noticing other things. I could easily replace the scrubber sponges I used to wash dishes and clean the kitchen. I could buy or make fabric napkins. I have a bag of towels and blankets designated “hairy beast things”, and I could use some of those towels to clean up Ms. Cat’s occasional messes. I also realized what a slave I am to disinfecting wipes, which are probably not that good to have around the house anyway. Time to research natural disinfecting cleaner recipes. Ditching all the disposables is probably one of the most money-saving things that we can do. Stocking up on kitchen towels is much more efficient than stocking up on paper towels. 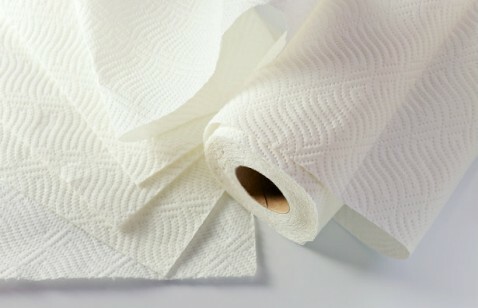 It can’t hurt to have some paper towels available, just in case clean water becomes scarce for a time, but it would be smart to reserve those for emergencies. Does anyone have more ideas for ditching reliance on disposable products? This entry was posted in Disposable Lifestyle, Ditching Disposables, Money Saving Tips. Bookmark the permalink. Yes my dear. Paper towels for animal messes and stomach bug incidents for sure. We hide our paper towel under the corner cabinet. Out of site, out of mind. We use lots of dish towels and fabric napkins. Disinfecting can be done with a vinegar/water cleaner that has a squirt of natural dish soap and any essential oils. Wild oregano is anti-viral, anti-microbial, anti-bacterial, all that good stuff, as is lavender. And essential oils are quite cost effective in the long run after the initial investment. Only drops are needed per bottle of cleaner. Even cheaper would be to put a spray top on a bottle of peroxide, and use it with vinegar. Don’t mix them, but spray with one them the other. With the vinegar and peroxide, do you spray one then wipe, then spray the other? Or spray them both, then wipe? And how much vinegar do you add to a spray bottle to make your cleaners? I’ve been buying the huge bottles of peroxide at the warehouse store. I’ve already turned one into a spot remover (2 parts peroxide, 1 part dish soap), and that works well. I’m thinking of replacing all our dish soap and bath soap with Castile soap. Or I may just start using vinegar and baking soda for cleaning dishes. It really seems to work well.